Claim: 'Sustained mass loss of the northeast Greenland ice sheet triggered by regional warming', but, not so fast | Watts Up With That? Some are conflating regional warming with global warming, because, you know, everything is about global warming. But imagine if I used the regional cooling in the southeastern United States to make a claim about that countering “global” warming. Our friends would have a cow. Observe how the media claims fall apart on examination of the paper. The CAGW alarmist media is awash today with claims based on a paper published in Nature Climate Change that “Greenland’s ice loss has nearly tripled in a decade” and “the Greenland ice sheet has lost it’s last grip.” As usual, the paper has been hyped by the media to portray impending doom, while examination of the actual scientific paper reveals very little of concern. Figure 1a shows the tiny region of Greenland that the paper studied, with a blowup of this region in figure 2 below. The authors find an increase in the natural glacier calving process in this regional, relatively tiny portion of the Greenland ice sheet. 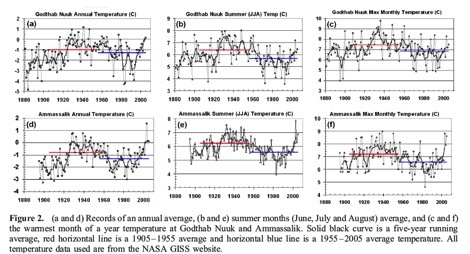 According to the authors, this is due to regional warming found at the site “HKH” marked by an “X” in fig. 2a below. The key word here is regional, which indicates these processes are localized and not characteristic of global warming. In fact, the authors also looked at another nearby site “DH” marked by an “X” in fig. 2a below and found that this site cooled over the past decade. These localized, regional changes were not predicted by climate models and are not supportive of the CAGW meme, and in fact suggest that other processes are responsible. For example, geothermal sources have recently been discovered under the Greenland ice sheet, which create lakes under the ice sheet and lubricate the natural slide to calving in the ocean. In addition, storm activity and winds largely control Arctic sea ice, which can act as an impediment to glacier calving. The word “global” is used twice, even though this tiny area likely contributes only a small fraction of global SLR. A better choice would be to write a paper about why this area is so sensitive, in spite of the fact that nearby there’s a regional cooling. March 17, 2014 in Climate News, Greenland ice sheet, Sea level. ..and wouldn’t that make glaciers move and calf faster? It doesn’t matter if it’s true or not. The media have already made their mark on the public consciousness. As long as the media are accomplices in the CAGW scam, then the truth does not matter. The message becomes the truth. Those who oppose message and cite the trutch are marginalized and ridiculed to the point where very few are willing to express a dissenting opinion. Well, in my country of Canada, global warming is rising to the roof-tops. The largest vertical acceleration was 2.10 mm.yr^-2. Supposing that the clock started with zero vertical velocity in 2006.0, then by 2007.0, the vertical velocity would reach 2.10 mm/yr, by 2008.0 it would be 4.20 mm/yr. By 2014.0 it should be about 15.8 mm/yr. By 2022 it would be about 31.6 mm/yr. By then there would have been 16 year with the surface falling at an average rate of 15.8 mm/yr, = 252.8 mm total loss. Crikey, at that rate, in 10 000 years the ice cap may have gone! But imagine if I used the regional cooling in the southeastern United States to make a claim about that countering “global” warming. Our friends would have a cow. But global warming is a cash cow for activist governments, who demand monetary indulgences from those humans blamed for causing it. So they would do the same for global cooling too, if they could just figure out a way to blame it on humans. And a Nobel Prize to the “climatologist” who figures out a way to blame simultaneous global warming and cooling on those pesky one-percenters (who actually create wealth for the rest of us 99-percenters). @JimS – We are more fortunate. It just keeps coming at us down here, just not feet at a time! because, you know, Greenland warming is a “regional” phenomenon. . .
Sea level rise has been claimed to be accelerating countless times before, despite it overall, for instance, being less in the second half of the 20th century than the first half (Holgate study). Sea level outright fell in 2010-2011 (e.g. http://wattsupwiththat.com/2011/08/24/nasa-notes-sea-level-is-falling-in-press-release-but-calls-it-a-pothole-on-road-to-higher-seas/ ). While there is an attempt to spin that as just weather, in reality, for instance, I can predict it will go negative again within a decade, as there has been a pattern over the decades (and centuries) as illustrated in http://tinyurl.com/nbnh7hq . Will Khan et al go to prison? Khan et al appear to have failed. Of course, a warmist can’t be wrong. Never mind. Their own figure shows that over most of Greenland the ice surface is *rising*. The areas shown in green have elevation change > 0. There may be a net loss averaged over the whole thing, but only a very small fraction of the area is actually losing ice. Differentiation between issues caused by man and naturally occuring events, and local vs global effects seems to be a weakness in most of the published papers and media spin regarding climate today. In this vane the book “The Worst Hard Times” is an historical documentary of the Dust Bowl with hard data as well as anecdotal and biographical information regarding those living in the three corners area of Oklahoma, Texas and Colorado as well as other areas where the Dust Bowl was most severe. It is well worth a read by anyone interested in climate/weather, as it points out how man can, indeed, have an effect upon local conditions. I say “local” since even though these conditions spread across the country at times, they were not truly global in nature. It is also very informative regarding the cyclical nature of weather/climate irrespective of man’s activities and the degree to which people must go to have any real impact upon their environment. In reality, and someone correct me here if there is data to the contrary, the effects were not really upon the weather or climate of the region, but were secondary results of the destruction of the 12,000 year old grasses which protected the soil. All in all, a very interesting read. The government at the time was a significant contributor to the origination of the problem and then very weak in it’s attempts to mediate the effects that the situation had upon the people and the environment. … where is the logic (and the brains) …? nothing to see , move along. apart from the dreaded models, they even see things that will not happen. You can try to claim this is “regional” however. 2) Direct GPS measurements say otherwise. So this new study just confirms what we already know about the melting of the Greenland ice sheet. I have been searching for a global sea level acceleration by examining groups of data sets from regional PSMSL data. If such an acceleration exists, then finding it is like looking for a needle in a hay stack. if we are in an inter glacial warming period in which the sea has already risen 150m then why is it a munch scream if 1 location has melting? as long as the inter glacial warming period exists then we should expect such data. The problem for the munch screamers is proving it has anything to do with co2. This is more an issue about reporting than it is about global warming. Have you ever read a headline that underplayed the content of the story? Have you ever read a headline that said ‘The Price of Bananas Climbs 2 Cents/Pound’, then read the story revealing a massive explosion and fire at the banana processing plant in Miami that killed 3 people? No! The headline would more likely be ‘Radioactive Bananas Go Up in Massive Fireball, Killing 3 and Threatening the City of Miami’. Press releases and headlines are specifically grafted to squeeze as much drama out of the story as possible without being a complete fabrication. In a 4 second tease to the local news, a TV station in Cleveland reported to viewers that war with the Soviet Union was imminent! Viewers watched the newscast in panic, but nothing was said about war with the USSR until the final story, which described a study by the Pentagon in which war with the Soviet Union would become imminent if a series of highly unlikely events were to occur. The tease worked. It was designed to get viewers to watch the local news, and they did. Yet, that type of embellishment loses its effectiveness if it is over used, and it has certainly been over used concerning global warming. It has been over used so much, that it would be harder than ever to convince the average Joe of a global warming crisis even if there was one. Thank goodness there isn’t. I worked in Cleveland for many years and nothing would surprise me regarding what those folks might believe. The “news” that is reported there is some of the most inaccurate and twisted that one can find. Whether limited to a tiny part of Greenland or the whole of Greenland one is still talking “regional”, not “global”. Any “global” discussion must include the southern as well as the northern hemisphere. Inconvenient for those peddling the catastrophic version of AGW is the record level of sea ice in the Antarctic, and the continued coverage of most of Antarctica with ice. The current net effect of global ice coverage on Earth’s albedo is contrary to the climate model predictions of catastrophic global warming due to anthropogenic CO2 production. Those models predicted that there would be less ice over all, resulting in less reflection of heat back into space, providing part of the positive feedback that would change a little bit of warming due to CO2 into a catastrophic process. The first use is: “The Greenland ice sheet has been one of the largest contributors to global sea-level rise over the past 20 years, accounting for 0.5 mm yr−1 of a total of 3.2 mm yr−1.” So that’s about one-sixth of the global sea-level rise which seems a reasonable usage. The giant bathtub (our ocean) is not filling up any faster that now than is was 150 years ago. No acceleration in rate means there is no net increase in rate of melting of non-floating ice around the world. Phil, actually I think the tide gauges are a much better and most important measurement of sea level rise. They are right there at the scene., They show about 1.8mm per year of sea level rise, thus even if it is contributing 1/6 to global sea level rise, that is 0.3mm/yr… really scary stuff. In response to the cherry-picked GISS data from April 2010, here is the GISS data from the prior decade. Looks like the globe is about 0.6C warmer over 40 years. We were told that would accelerate. It didn’t. In fact, it “paused”. Color me alarmed. The paper might be focused on the details of a smaller portion of Greenland, but stop and consider ‘Figure 1: Changes in surface elevations obtained using ICESat, ATM, LVIS and ENVISAT data’ for a moment. The changes between 2003-2006, 2006-2009, and 2009-2012 show elevations decreasing at faster rates around the majority of coastal Greenland — the entire west coast, the south east coast, and most recently now in the north east. What’s going on in Greenland isn’t localized, unless you call most of coastal Greenland ‘local’. It’s also not a “relatively tiny part” of the Greenland ice sheet if the North East ice stream and basin is the largest in Greenland. I love how the people think the 1200km smoothing means a whole lot. The irony is that the MWP and the LIA were local, (or so they say) and yet somehow this is global. AGW has the ability to talk out of both sides of their mouths at the same time. So, um, I have a question for them, how is it that ice will melt when the temperature is below, and sometimes well below, freezing? (I’m not talking about artic ice were they can explain it away by warmer seawater). Instead of a few millimeters of ocean rise, what we should be worried about is interior spring flooding from heavy snow packs in Canada and the northern midwestern states. Are the Dakotas going to need more sand bagging this spring? If a paper in 10 years shows a reversal with cooling at HKH and warming at DH. It will mean exactly the same thing as today’s paper, very little. And that jai enjoys being obtuse. The Greenland ice sheet has been one of the largest contributors to global sea-level rise over the past 20 years, accounting for 0.5 mm yr−1 of a total of 3.2 mm yr−1. A significant portion of this contribution is associated with the speed-up of an increased number of glaciers in southeast and northwest Greenland. The sea level data from the University of Colorado shows this 3.2 mm yr−1 per year to be constant for the last 20 years. So here is a problem. If the amount of ice melt is accelerating, why is it not showing up in the rate of sea level rise? Also, as the Greenland is losing ice at a far greater rate than Antarctica, where does the rest of the global sea level rise come from? Before anyone says “thermal expansion of the oceans”, try working out how much 3km of average ocean depth would need to increase in temperature to raise levels by 1mm, then check against the estimated warming of the oceans per annum. The alleged causes of sea level rise do not reconcile with the measured sea level rise. see that small fleck of higher temperature on the west coast of Australia? the width of that region is 100Km across. so tell me again how there is 1200km of smoothing??? I suggest you re-read my post and review the link to the GRACE data. You seem to be confusing ice mass with ice extent. You posted, “Those models predicted that there would be less ice over all” which happens to be exactly what NASA’s GRACE is showing. There are too many probablys and perhaps in the paper, for my taste. Their findings aren’t verified by others or replicated; in fact as one of the news reports states, there is doubt about the findings. People might believe that peer review means replication, verification, duplication; but it doesn’t, at least not in this field. These kinds of papers often spawn more confusion and errors than they are worth. They remind me of the many papers in paleontology and archaeology that trumpet yet another new but alas, extinct hominid species, every time a new tooth or fragment of tibia is unearthed. At least in that field, there has been concerted effort in the past decade to sweep clean. People live in Death Valley, the middle of the Sahara desert, below sea level in the Netherlands, the sinking City of Venice, the deepest darkest rainiest jungles on the planet, Acapulco where it is 32C every day, the coldest parts of the Arctic at Eureka Canada, the coldest parts of Siberia, on top of 4 km high glaciers at the South Pole at -80C, on all of the oceans and lakes, and 370 kms into space. Global warming will mean nothing to us. We have adapted with no problem to every place possible except under the ocean. Whatever happens anywhere on the planet, the people who live there will have no issue with adapting to very small changes that takes more than 100 years. Their “after a quarter of a century stability” line in the abstract is the money line, i.e. this has happened before. I am surprised there is not even a hint of atmospheric circulation analysis in the abstract… It’s been known that along the warm air advection corridors, regional warming will reflect the increased dynamics of circulation prompted by cooler, more powerful MPHs during a transitional phase toward a global cooling. As for the geothermal sources, it’s nice but why its influence only now? This is a tad like the warmists explanation for the pause. Sorry, we don’t know that. The ocean basins, unlike your bathtub, are not a fixed size. We do not know their size. We don’t know if they are getting smaller or larger. Changes in sea level might not be related to ice melting/freezing at all. In 1942 a squadron of P-38’s and B-17’s bound for Scotland was forced to ditch on that same southeast coast of Greenland that you say is losing ice at an accelerating rate. Fifty years later (1992), one of those P-38’s was extracted from under 260 feet of ice from accumulated snow. I would say, we have a long way to go to get back to the ‘normal’ ice elevations of 1942. >Phil, actually I think the tide gauges are a much better and most important measurement of sea level rise. They are right there at the scene., They show about 1.8mm per year of sea level rise, thus even if it is contributing 1/6 to global sea level rise, that is 0.3mm/yr… really scary stuff. Noticing the same thing, my approach is slightly different. If the Greenland ice sheet contributes 0.5mm (based on ice mass loss) and the total is 1.8mm, then there is only 1.3mm contributed by everything else. The 0.5 and the 1.8 are based on measurements, right? It seems things are on a cooling trend, then. researchers say “a self-perpetuating feedback process may have been triggered” – Obviously! More alarmist predictions = more grant money = more alarmist predictions…. Nature Climate Change magazine …. with a title like that, what else could they say? In 1942 a squadron of P-38′s and B-17′s bound for Scotland was forced to ditch on that same southeast coast of Greenland that you say is losing ice at an accelerating rate. Fifty years later (1992), one of those P-38′s was extracted from under 260 feet of ice from accumulated snow. I would say, we have a long way to go to get back to the ‘normal’ ice elevations of 1942. The observation that some aircraft lost in 1942 were under 260 feet of ice 50 years later doesn’t mean the surface of the ice sheet somehow became 260 feet taller since 1942 and will take a long time to “get back to ‘normal'”. Perhaps this is a difficult concept, but the southeast coast of Greenland has a very high annual accumulation rate that is roughly balanced by compaction and outflow. That’s why even with a large 1m/year water equivalent accumulation rate, the ice sheet surface isn’t getting hundreds of metres taller every century. In fact, quite the opposite is now occurring — the measurements cited in the paper show the ice surface elevation is currently getting lower. But if you parked an aircraft there today, it would still disappear under the snow. This whole Greenland melt ‘thingey’ is ‘unprecedented’. We must act then!!! It’s worse than I imagined. We can cherry pick any region and time to show that we are headed to another glaciation. / sarc Imagine if we were in 2005? Even the much warmer eemian interglacial showed modest ice sheet reduction. The melting of icebergs lowers the water level. The volume of ice is larger than the volume of water. Fill a glass to the brim with water and ice; when the ice is melted the water level will be lowered not raised. Sorry, Frank, your assertions are only 50% correct and your proof is faulty. Agreed the volume of ice in a iceberg is greater than the volume of water that it will eventually turn into. But as icebergs float, the weight of water they displace is exactly equal to the weight of ice they contain. Hence, when they melt, the volume of ice collapses into the volume of water they displaced. Hence on melting they neither raise nor lower water level. Same with your ice cubes and water in a glass. The mass of ice and water is unchanged. As the density of ice is less than water, on melting the ice cubes will occupy less space and the water level will decrease. BUT, this is only true if the ice is packed into the glass. If the ice cubes are freely floating, and the water is right to the brim of the glass, you will find that the water level is unchanged when the ice cubes are completely melted.